If you were only familiar with the DEWALT DW717 Double Bevel Sliding Compound Miter Saw‘s capacities, you might think the “10-inch” in the title of this page should actually be “12-inch,” but this is a 10 inch slider that actually thinks it’s a 12 incher, with impressive 90° and 45° crosscut capacities of 2 x 12 dimensional lumber, and 2 x 14 when using it’s back fence feature. Vertical cut capacities are also impressive. The DW717 is a real workhorse, driven by a powerful 15 AMP motor, with lightweight ergonomic design, cam lock miter handle, tall sliding fence system, 7 bevel and 11 miter detents, in addition to it’s durability and ease-of-use. 2 What Are The Cons? The DW717 is equipped with an array of useful features both large and small, and it’s those little extras that make it a standout. An electronic brake, adjustable stainless steel miter detent plate, sliding fences both left and right, and accessories that extend productivity all make the operator’s life easier. The saw’s 15 AMP motor puts out 4,000 RPM through a V-belt drive to power through dense hardwoods, and it’s electronic brake contributes to both safety and productivity, stopping the blade within five seconds of releasing the trigger. The dual horizontal steel rails combine with linear ball bearings and an innovative clamping mechanism for smooth, precise sliding action. The durable machined base fence support makes sure the fence stays square, while improved ergonomics in the form of a horizontal handle keep controls operator friendly. A user commented that this saw is definitely “lefty friendly,” referring to the trigger placement. A spindle lock is provided for easier blade changes, a lock down pin helps avoid damage during transport, and a hole in the trigger for a padlock keeps your DW717 secure. The 0°-48° left and right bevel range combined with a miter range of 60° left and 52° right give the DEWALT DW717 tremendous versatility, made even greater by the miter detent override which allows you to precisely dial in those angles that are oh-so-close to a detent hole. The cam lock miter handle locks down the angle fast, and if the miter scale gets out of square, the stainless steel miter detent plate can be adjusted to bring it back to true. The seven bevel and eleven miter detents make setting standard angles quick and repeatable, and the included material clamp keeps your workpiece from moving during a cut. 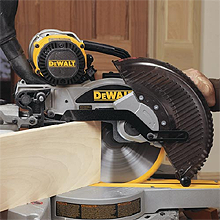 Dust collection on this DEWALT miter saw is not what it could be, according to user reviews. It was pointed out that when the saw head is lowered during a cut, the dust collection tube is pointing north of 45 degrees, making collection with a dust bag difficult. Most users who employed a shop vac or other vacuum system felt they had no great problem with dust collection. 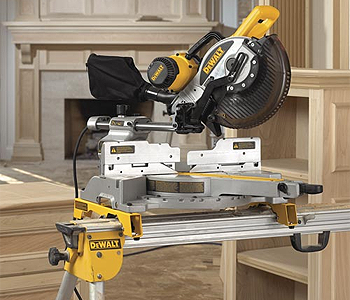 So what do users have to say about the DEWALT DW717? Accessories (sold separately) for the saw range from the DW7187 Adjustable Miter-Saw Laser System and DWS7085 Miter Saw LED Worklight System (See DWS7085 in action!) to the DWX723 Heavy Duty Miter Saw Stand. You can also get the DW7080 Work Support Extension, DW7082 Clamp (similar to the one included), and the DW7084 Crown Molding Stops. NOTE: Various descriptions of these accessories do NOT list the DW717 among the saws they will fit, however, all of the accessories above are listed on pages 4-5 of the DW717 owner’s manual as being appropriate for the saw. Dust collection, as noted above, was the major complaint. If you are able to use a shop vac or other dust collection system, or you use the saw outside, this becomes much less of a factor. Some users found the stock blade to be poor quality, others not. 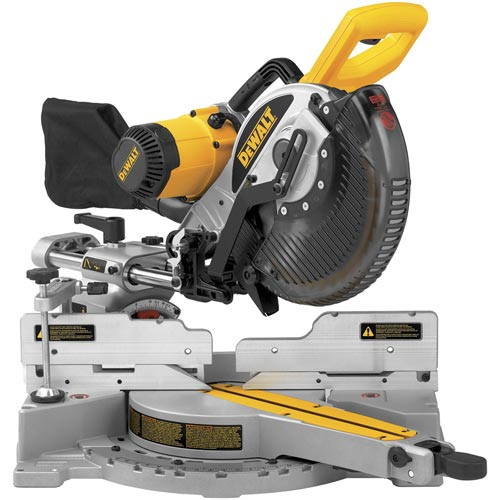 The difference could be a change in the quality of stock miter saw blades over the years, or just different uses – framing versus woodworking. A very few minor complaints ranged from difficulty getting at the blade guard screws to change the blade, to wishing the table were a bit larger.